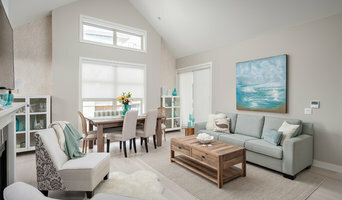 The Spotted Frog Designs is an award winning full service, interior design company within an upscale furniture, home accessories and lifestyle boutique nestled in the heart of historic Steveston Village in Richmond BC. Specializing in residential design, we offer professional services for home styling/decorating, renovations, new home construction and feng shui consulting. Tina Moizer Designs has built a reputation for creating unique interior spaces designed to complement the lifestyle and tastes of her clients. Interior Designer Denise Mitchell has been designing attractive, functional and esthetically pleasing interior spaces since 1992. Good design is forever. We work hand in hand with our clients in order to blend our expertise with their ideas and budget. Our aspiration is a look and style that is unique and memorable. Red Plum Design is the only design firm that includes design education for clients while creating their design, enabling them to make confident, wise design decisions on their own once our role in the project comes to an end. We are a full-service interior design firm focused on luxury private residences in Vancouver and the Lower Mainland. We guide you at every step of the design process, ensuring that costly and unsightly mistakes are not made. We believe every space tells a story, one that should be told elegantly. We distill the personality, values and influences that inspire our clients into a design that tells a clear story about what each client loves, admires and feels most comfortable living in. We will uncover the story you want your space to tell, and will introduce you to materials, finishes and design ideas that tell your story, beautifully. Lana Lounsbury Interiors is a full service interior design firm specializing in residential renovation and decoration. We have been featured in many publications including Better Homes and Gardens. White Rock/South Surrey-based interior decorating and design boutique that is very welcoming. We specialize in creating inspired, client-focused living spaces designed to promote positive energy and a sense of wellbeing. We enjoy reflecting your individual style, tastes and needs. Cara Interiors works with you to create a space of beauty and comfort, where you can get the most out of everyday living — today and tomorrow. Look forward to collaborating on your next project! We partner with clients to create intelligent design solutions that reflect personality and style. Our design philosophy is based on trust, quality, longevity and responsibility. TAP Designs is led by Teresa Ann Phillips, a creative but pragmatic design expert. Teresa services clients on Vancouver Island looking for exterior/interior redesign and staging solutions. With over 24 years of professional experience, functionality is at the core of what we do as designers - creating spaces that are relevant to the needs of each client. Miccaro Designs is an award-winning, full-service boutique design firm closely working with clientele from many areas of the Vancouver lower mainland. Design services range from one room redesigns to newly built custom homes. Michele of Miccaro Designs offers clients both complete turnkey solutions, cost-effective design consultations and various services to meet "YOUR" needs. Michele works comfortably across a range of styles but leans toward the classic but with a modern twist of what's current. She believes that good design can be achieved in every home, at every level, in any neighborhood and your home can be beautiful and comfortable, regardless of budget or square footage. It's all about the function ability and harmony within the personal spaces. The goal is to help clients achieve their vision and creatively inject personal details that transform a space into something exclusive, "HOME". It's a word that means different things to different people, but for me home means comfort, security, respite and love. I was inspired at a young age by the distinctive Mediterranean styled home I grew up in and my love of design was sparked by my mother who invited me to redesign a powder room as a teen. From that moment forward, I was hooked. It was just a matter of time before my creativity found fruition in my own design firm. I love the creative atmosphere that residential interior design offers me. I'm also a real people person, so I truly enjoy the collaborative process that happens between my clients and my trusted trades that invest their talents into the various projects. Our award winning interior design team combines innovative design solutions with detailed drafting services to create complete house plans for new construction. 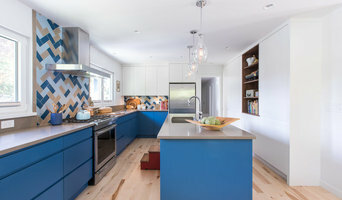 Best of Houzz Winner 2016-2018! Our passion is in creating edited, cohesive spaces that exceed our clients’ expectations and daily needs. We work to house modern lifestyles and design bespoke, tailored spaces that suit each client. We believe that a strong partnership with our clients is paramount to successful design. Gabrielle Levin is an international designer with vast education and experience. She is a Feng Shui expert who marries design with unique features that ensure health, longevity, abundance and beauty. We specialize in the Interior Design, Blueprints for Interior Construction, Complete furniture packages & installations for large scale ( 5,000 - 15,000+ square foot) custom designed vacation and permanent homes in Canada, the US mainland, Hawaii and beyond. Offices located in Vancouver BC and Hawaii. Our design philosophy stems from the belief that every space should be an extension of the owners personality and style. We believe that a beautiful home isn’t something you postpone for the future; it is something you design for the present. 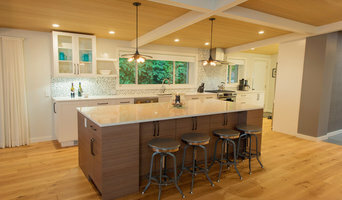 Interior design services for renovations and custom homes throughout the lower mainland of BC. 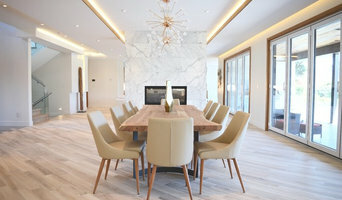 Certified Interior Designer based in Vancouver, BC. At SMC Interior Design, we help clients create spaces that work for them – whether they’re updating, renovating, or building from the ground up. Our team has almost three decades of experience transforming homeowners’ visions into reality. We create luxury, but we make the process simple for you. We specialize in residential interior design, including renovation and new construction, through to furnishings and accessories. Mission Statement: To listen with sensitivity to your ideas and feelings about your home or work space. To collaborate with you to create a timeless interior design that is smart & sustainable, while bringing comfort, elegance, function and refinement to your everyday living and working. We serve all of Vancouver and the Lower Mainland thru to Whistler, Sunshine Coast, Okanagan & Gulf Islands, San Juan Islands, Washington and Hawaii.